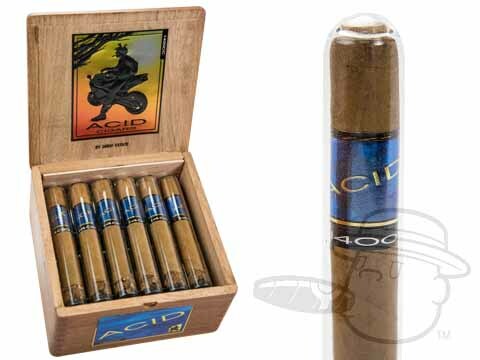 A long-time favorite in the Acid Blue line, Acid 1400cc is infused with Drew Estate's secret blend of herbs and botanicals and is beautifully presented in individual glass tubes. The cigars feature a silky Connecticut wrapper, flawless construction, and of course, the one of a kind taste and aroma that Drew Estates Acid Cigars are famous for.Acid 1400cc is a uniquely flavorful, mellow-to-medium bodied cigar in a traditional 5x50 Robusto size. love drew estates.great flavor,no after taste in the morning! An easy smoke with a nice sweetness. One of my favs. The best flavored Acid on the market. If you like sweet cigars you have to try this one! By far my favorite cigar. I like to smoke them with a glass of bourbon. It's the cigar my husband prefers over everything! He smokes others for variety, but always has these on hand! These are the best cigars, the best price. Plus arrived in 2 days. This is one of my favorites and go to cigars. A mild slightly sweet taste. I totally love these cigars. The have a great mild taste and burn well as we'll. this cigar is the best bang for your buck if you smoke everyday like myself. These cigars are top quality and bestcigarprices.com had them at my door within 3 days! I like milder cigars, with lightly sweetened tips. I am a pipe smoker, too. The kicker is the aroma from the lit end. The smoke is aromatic and floral. As a minor complaint, across the whole line, I dock Acids for softening, as the smoking progresses. I also am not a fan of severe box pressed cigars, and that keeps me from ordering those Acids. This is the only cigar brand my wife loves having me smoke (Macanudo and Cohiba Red Dot are my other favorites), as she is a connoisseur of good cooking. Very happy with the quick delivery. The cigar was as smooth as advertised. Every one was very nice and helpful. My husband loved the gift! These are one of the best cigars for flavor, smell & size that I've found on the market today! My wife got me some of these as stocking stuffers for Christmas. I had never heard of Acid cigars before until then. when I tried it I was amazed at the smoothness and flavor. I can honestly say best cigar I've ever tried . I'm looking forward at trying the whole line of Acid cigars. Love this cigar. Easy smoking and not overbearing. I always get lots of compliments on the aroma of he cigar! Great cigar!!! If you like a little sweet taste to your cigar, This is the one you are looking for!! Great smell and taste. I give it a Two Thumbs Up!! Randleman, NC. KLG. I thoroughly enjoy this stick with a small glass of bourbon. This is definitely my go to stick. Smokes well tastes great. My only complaint is about every 3 sticks out of a box has a few issues burning properly. Also out of a recent box I have found two sticks with holes. Made it a bit harder to smoke and slightly changed the flavor. One you must try. The 1400cc is by far my favorite smoke, whether I'm fly fishing on the Yakima River or working in the garden. This is the only cigar that I've smoked that women comment on how good they smell ( which is an unexpected bonus). Acid 1400cc is rated 4.8 out of 5 based on 36 customer ratings.